Good news for all the candidates who are searching for the ADP Off Campus 2018. You can now apply for ADP Off Campus 2018 Drive For Freshers with the help of this article. In this article, you can find all the details and the requirements that are needed to attend the interview process of ADP. To help the aspirants in order to secure the good marks and make their interview process a successful one, we have gathered all the required information such as interview questions, placement papers, syllabus and many others that will be helpful to the candidate during the interview and provided them at the same place. This article will provide you the complete details regarding ADP recruitment. ADP provides the human resources management’s software and services. It is a multinational company that is headquartered in New Jersey. ADP has announced about the ADP Off Campus 2018 Drive For Freshers to recruit the recent graduates of the years 2017 and 2018 in order to fill the various vacant positions. We feel that this is the best opportunity for all the candidates who are in the search of a job to make their wish true. This could the best time for all the students to start preparing for the interview without any late. Students can make of the data such as the interview questions and the provided ADP placement papers in order to make their interview procedure easy at ADP Off Campus 2018 Drive For Freshers. The fresher graduates who have completed their education the year 2017 and who will be completing their education in the year 2018 in any of the following courses are the students who are eligible for attending this interview. We are here providing the required skills that must be possessed by the candidate in order the attend the ADP Off Campus 2018 Drive For Freshers. The candidate must be flexible to work in shifts. The candidate should possess good communication skills. He/ she must be ready to relocate if necessary. The must-have quick learning and understanding skills. Face to face technical interview and HR interview. 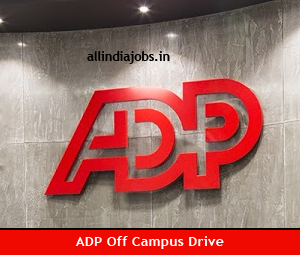 The students who are interested to attend the interview drive at ADP Off Campus 2018 Drive For Freshers must be having at least 65 percent of the aggregate score through their career. The candidates who are not satisfying this criterion need not apply for this recruitment. The students having one backlog can attend the interview but they should not be having any current backlogs to the time when they will be called for the job. The salary for a fresher graduate in the ADP Company would be ranging from around 3.5 lakhs to 4 lakhs per annum. The students can make use of this opportunity so that they can have a bright and settled future. There will also be some added benefits along with the salary. The fresher graduates of the years 2017 and 2018 can be able to apply for this ADP Off Campus 2018 Drive For Freshers interview with the help of the links that are provided here. Initially, click on the link that is provided for the application process. Now you will be getting a window prompting you to fill in the required details. After filling the details, click on the submit button. By clicking the submit button your registration process for ADP Off-Campus drive is successfully completed. The students interested in attending the ADP Off Campus 2018 Drive For Freshers are requested to carry the mandatory documents like the resume, photographs, 10 class and intermediate marks memos and also the marks lists of the previous semesters in order to submit them to the interviewer. The students can make use of the following tips to make their interview successful at ADP. Try to sound as natural as possible. This will make you appear more confident. Don’t get tensed for any small mistake happened and try to make best for the remaining. Always be positive and confident. Check the commonly asked HR Interview Questions. We have provided almost all the information that is required for you to attend the ADP Off Campus 2018 Drive For Freshers. The students can get connected to our website www.allindiajobs.in in order to get notified with the latest openings available. Share this information with your friends which will be useful for them.